The flight from Sydney to Ho Chi Minh City was uneventful. Darwin airport was pretty sterile, but there was a huge round red setting sun as we boarded for the leg to HCMC, giving some feel for a different world. The last book in Colin Dexter's Inspector Morse series, The Remorseful Day, proved the perfect length for the flight, as I finished it just before landing. I was through immigration and customs in five minutes and with no checked luggage didn't have to wait. Richard was there to meet me, with a 1.5 litre bottle of water and a voucher for the taxi into town ($8). 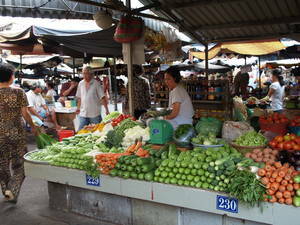 That dropped us off at the Mai Phai hotel, on Pham Ngu Lao in the tourist/backpacker enclave. It was pretty late — my plane had landed after 10pm — but we went for a short walk before I showered and slept. It was all tourists in the restaurants and bars, but in the back alleys just metres away the locals were sleeping, sitting, and eating. There were motorcycles everywhere and lots of people wearing face masks. 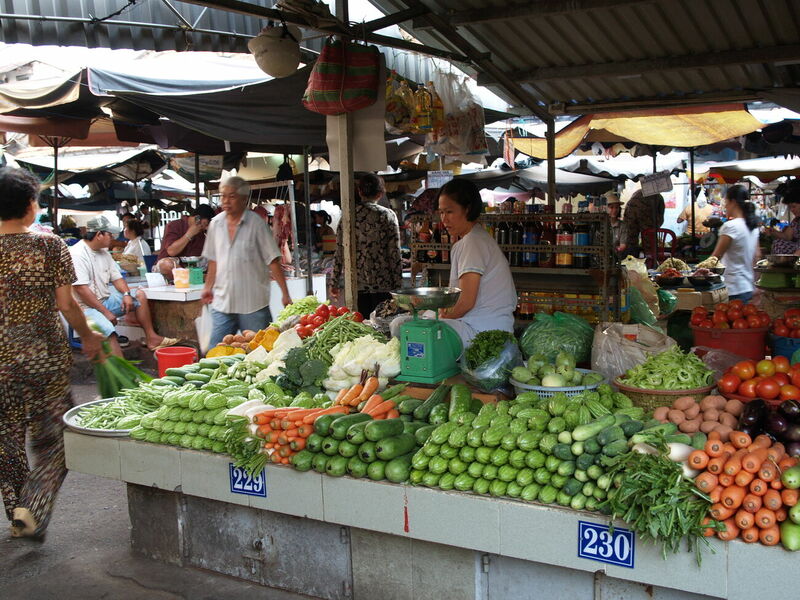 We got up at 6am, and headed west to a local food market for breakfast. This consisted of a prawn/onion/sprout pancake (15,000 dong, or less than $1). 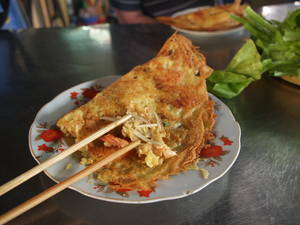 We then moved to another stall and I had my first Vietnamese coffee (6,500 dong, maybe 40c). 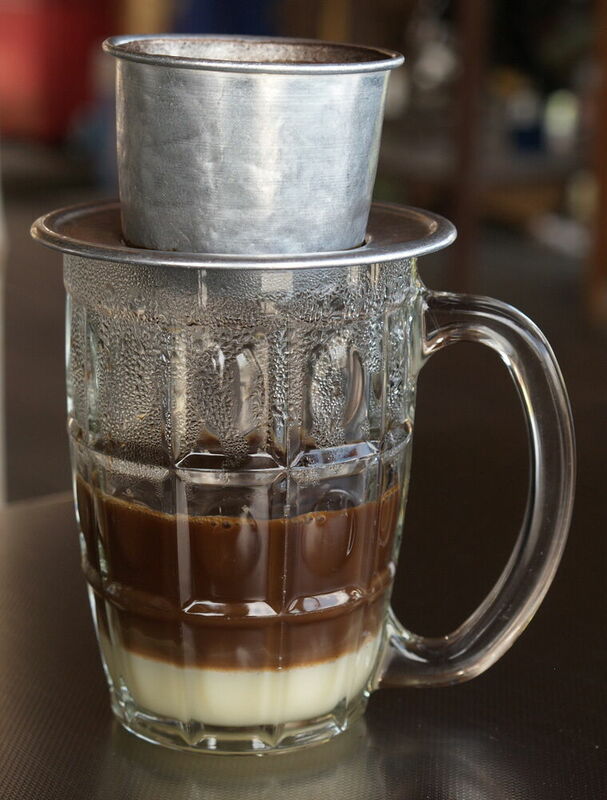 Vietnamese coffee is black coffee (usually with chicory) made in a little drip filter which sits over the glass, where it drips onto a thin layer of condensed milk. I got to like this during the trip, to the extent that I bought two of the filters at the end. 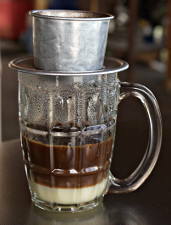 "INeedCoffee" has more information on Vietnamese coffee.